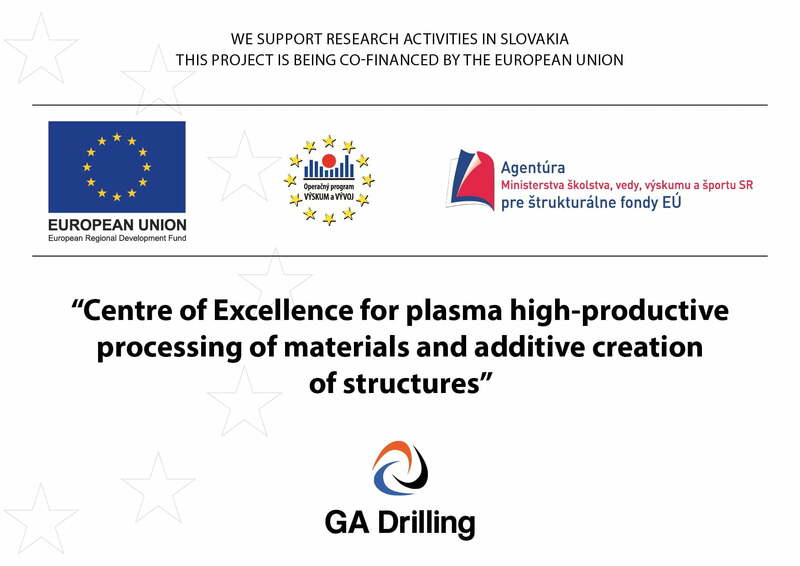 On February 5th, 2014 GA Drilling implemented a project entitled „Centre of Excellence for plasma high-productive processing of materials and additive creation of structures” along with its partners, Ecoland, s.r.o., the Institute of Materials and Machine Mechanics of Slovak Academy of Sciences and CELIM Slovakia. The main goal of the project was to provide know-how and the necessary infrastructure in the strategic area of highly productive plasma processing of materials and additive creation of structures. The project was implemented through three main activities and two supporting project activities. Project duration was 21 months which was an optimal time to achieve its objectives. The project was successfully finished on October 31st, 2015 and we would like to take up again to it in the 2nd stage of this project, where we will continue with industrial research.